Last week we held our annual carol service at St Martin-in-the-Fields in London. Kevin Gosden, father of missing Andrew Gosden, was one of the people to speak at the service. His moving words are below. 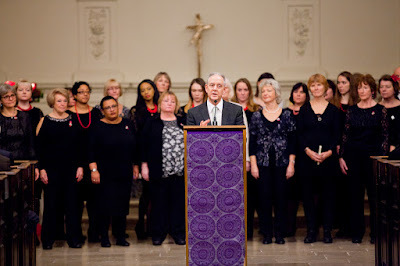 Last year, I spoke about 'hope' at the Carol Service in York. To my amazement, what I said became a beautiful song written by our choir leader, and then went on to become a charity single which reached number 11 in the download charts, thanks to some generous celebrities joining the choir to record the song. Today I have been asked to share some of my personal thoughts and experiences about hope, as I did at York last year. I think that there are slightly different meanings to the idea of hope. The first one is where "hope" means a future expectation, an event which we know and fully expect to take place. This has personal meaning for me as it is part of my Christian faith. We probably all know the phrase "The hope of heaven". That is the expectation and knowledge that when I die I will go to heaven. To me, that is not just an emotional response, but a reasoned one based on the life, teachings, death and resurrection of Jesus. i.e. it is a confident expectation. This is the kind of hope I had when Andrew first went missing. I fully expected him to be back, or turn up at a relative or friend's house. None of us in the family could imagine anything other; it was just a case of searching and waiting. It seems to me that many others have experienced the same thing, never imagining that even years later we would still not know what happened to our missing loved ones. The other kind of "hope" is perhaps the more common meaning and to me it means wishful thinking. We desperately would like something to happen - in our case to have news of Andrew - but have no way of knowing whether that may ever happen. Over time even that sense of wishful thinking seems to dissipate. We have done so many things to try and find Andrew that have not proved successful - now we hardly allow ourselves to think that the latest campaign might have any concrete effect so that when it does not, we do not feel let down or any worse off than we were before our efforts. Our initial expectation type hope of finding Andrew has waned through many cycles of experience to a distant dream type of hope. There always seems to be a little hope there, but it does not seem to be a hope that can be based upon anything objective or concrete. This makes me wonder why we hold onto hope when it comes to news of our missing loved ones. Wouldn't it be easier to give up and never give a thought to seeing our loved ones again? I have often wondered if it would improve my struggles with mental health to give up hope, shut everything down aside from the daily chores of life and just make the best of a changed situation. But I cannot do that, however logical it might seem. It brings to mind another common phrase - "hopes and fears" - and I think this is why it is impossible to let go of hope. If we let go of that, it gives into our fears - perhaps expectations - that our loved ones are dead or will never be seen again. None of us want to see our worst fears realised and yet, at the same time, we mostly feel that evidence of death would be preferable to this endless sense of unknowing which leaves us trapped since we can neither celebrate nor grieve. That brings us back to the "Living in Limbo" issue, which affects all of us with a missing loved one so powerfully. Turning endless circles in our minds between our hope and our fears. The only constructive thing I can think of really is to say that the opposite and antidote to fear is not hope nor is it courage. The opposite to fear is love. We mostly think the opposite of love is hate, but in the Bible we get a very different perspective because it tells us that in fact "perfect love drives out fear". This is why we have the two sorts of "hope". The perfect love of God for us, shown through Jesus is what gives us the sure and certain hope of heaven. I find that perspective on life is not one that is always easy to take on board and is one reason why the words of the Bible are so revolutionary. When it comes to our missing loved ones most of us started out with an expectation sort of hope, which dissipated into a wishful thinking sort of hope as our fears become more real to us. We began fully expecting to find them and over time we ended up wishing. So why hold on to any sort of hope? We continue to keep hope with us because it is based upon our love for our missing relatives. I think if we let go of hope, then we give up on loving, which means giving in to our fears. Personally I find the idea of forgetting my love for Andrew incomprehensible, so I suspect I shall continue to experience hope. And however thin that hope wears, however pie in the sky it may seem, I think that it is healthier psychologically to have it with me because somehow to stop hoping would mean to stop loving and to give in to my fears. But as we approach Christmas, we are drawn again to the coming of Jesus - God made flesh in our world. It reminds us that we do have a solid hope. The hope of heaven. A place where we will have the answers to our questions. A place where perfect love drives out all fear. That is the only place I know of to put my hope.